The 2012 Tour de France. Twenty stages, 3,497 kilometres. And yes, there’s an app for that! If you’ve been following me writing about gadgets over the past six years, both on that big gadget site I used to work for, and now on my own site, you’d know that around this time of year I manage to sneak in a few cycling-related stories. Why? Because tonight, pretty much my favourite sporting event of the year* takes place – the Tour de France. And 2012 is a special year for the Tour, from an Australian standpoint. For one, the reigning champion is an Australian, after Cadel Evans’ magnificent victory in the yellow jersey competition last year. Secondly, this year, for the very first time an Australian team is participating, the Orica / GreenEdge team. In the team are five Aussies, led by Stuart O’Grady. The numbers. 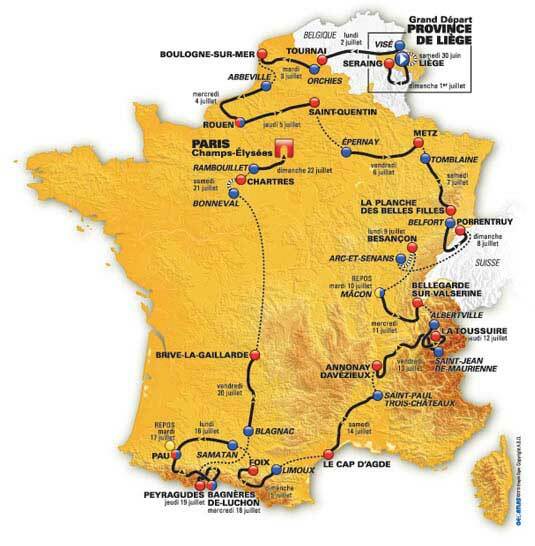 The 99th Tour de France starts on June 30, in Liege, Belgium, and finishes on the Champs Elysee in Paris on July 22. That’s 20 stages, over 3,497 kilometres. All stages will be televised on SBS, I think starting most nights around 10.00 pm. Check your local guides to be sure. Now, to work in some tech. If want to more of a feel for the race, and you have an iPhone or iPad, or an Android smartphone or tablet, SBS have a free app called Tour Tracker. Computer users, don’t feel left out, it’s there for you at SBS’ Cycling Central website. The app, or the Tour Tracker website, will stream the video when available, plus provide the route stats (elevation, distance, etc), the race standings, stage information, rider and team info, a Tour de France dictionary and more. It is great stuff for cycling fans. For the apps, search for ‘Tour Tracker’ on your app store of choice. You don’t like sport? But wait, there’s more! As I say every year, if it’s not something you normally watch, because you don’t like sport, or cycling, or know much about it, I urge you to give it a try. Watching it is the best travelogue you’ll ever see for the country of France, along with an education on history, culture, and, with the Gabriel Gaté’s entertaining little spots, a schooling on French food and wine. Who knows, this could be a sport that gets you in for three weeks or so each year. The sites, the sounds, the mountains, the descent, the tactics… it is a magnificent event. It hooked me in the late 80s, and I’ve been a Tour fan ever since. So, look for quite a bit of cycling tech stories over the next few weeks, along with our regular spectrum of gadgets. And to mark the occasion, we also have a Tour de France related web background on the site. In the meantime, here’s a two recent stories TechStyles has published with a cycling theme – Glo-Bars LED bicycle lighting system and Revolights – cycling’s wheels of light. *I use the term pretty much there to leave in the opportunity for the Wests Tigers and Sydney Swans to win their respective premierships. As happened in 2005. Yes, I’m holding tight the memories of that particular sporting year.